USDEs Arne Duncan does not appreciate honesty. Paul Gammill, a USDE staffer, complained to the USDE that the departments plans to institute a P-20 cradle to career network would violate FERPA. USDEs Carmel Martin literally kicked the guy out with a swift boot to the tush from her high heels. Thats right, the USDEs intent to facilitate statewide longitudinal data systems capable of tracking individuals from pre-kindergarten through employment arises out of questionable circumstances. FERPA was amended after a USDE staffer threatened to out the department for violating FERPA regulations in clauses that officials intended to include in the federal stimulus Bill. As part of Race to the Top, the USDE announced that RTT grant awards will be based, in part, on the willingness of states to expand state-wide longitudinal data systems that include a broad swath of student information. In addition to using states’ willingness to create such an interoperable student database as a criterion for federal funding, the USDE reportedly played a direct role in the development of a multi-jurisdictional database. The goal was to first link schools within a state and then to link states across the country to form a national public education data base system. The federal government invested over $600 million in state-level data systems. In addition, the American Relief and Recovery Act (ARRA) required that states adopt these statewide data systems as a condition of funding, and further specifies the elements to be included. Specifically, amendments to FERPA were proposed to substantially increase the number of entities allowed to access personally identifiable student information without the student’s or parent’s consent. 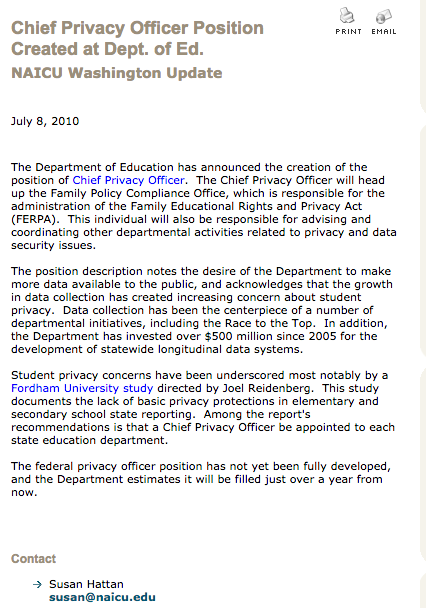 In July 2010, USDE created a position for Chief Privacy Officer to oversee the longitudinal data system. Analyst Paul Gammill was appointed the director of the newly formed USDE Family Policy Compliance Office (FPCO). He was in charge of directing and advising on the proposed P-20 cradle to career operation. For background, Mr. Gammill previously served as an Educational & Health Data and Accountability Manager. He is a former science teacher, school district administrator, State level consultant, national level as director of the FPCO and as a consultant to the College Board’s Equity 2000 project. Gammill also served on the Technology and Security Task Force of the National Forum on Education Statistics circa 1998. Health and Education Data Systems and Enterprise Architect with broad experience implementing analytical management techniques, resulting in increased organizational effectiveness and demonstrable improvements in education and health. • Successfully implemented quality management programs in educational, health, governmental, commercial and non-profit organizations. • Strong technical, managerial and organizational experience in converting business needs into a robust data system. • Experience in developing data architecture systems to support research and accountability. • Strong experience in data systems and process improvement reporting for education and health data. • Provided the College Board with help in developing a business process and resulting architecture in support of the Board’s nation wide pre-college management and reform efforts. • Increased organizational efficiency and product quality through the use of respected quality assurance standards and process improvement models such as the CMMI. • Experienced in tailoring existing management and quality models to meet existing requirements and in reinforcing these models through the use of appropriate measures and reports. • Created innovative data, data warehouse, and reporting systems that provided improvements in organizational efficiency, accountability and profitability. • Successfully managed the migration of data from multiple systems into research quality data warehouse systems. • Provided leadership to educational agencies, commercial, governmental and non-profit organizations. The FPCO that Gemmill headed, primarily dealt with implementation of the Family Educational Rights and Privacy Act (FERPA) and the Protection of Pupil Rights Amendment(PPRA). Gammill was reportedly dismissed because he had argued consistently that some of what the administration wanted states to do — sharing their students’ educational records with state labor agencies, for instance — would violate the FERPA privacy law. Paul Gammill, had argued that the administration should work to change the federal privacy law, openly, rather than do end-runs around it which the department was reluctant to do for fear the measure would not pass muster in Congress. Eventually, USDE did change FERPA via a Congressional amendment.. But, not until after Gammill had been terminated and made a fuss about the fact that the proposed LDS cradle to career national data system violated the then existing FERPA laws..
WASHINGTON — The U.S. Education Department has fired the top federal official charged with protecting student privacy, in what the dismissed official says was a conflict with the agency’s political leaders over their zeal to encourage the collection of data about students’ academic performance. But Gammill, not so encumbered, maintains that he was dismissed because, on several occasions, he argued in internal meetings and documents that the department’s approach to prodding states to expand their longitudinal student data systems violated the Family Educational Rights and Privacy Act, which protects the privacy of students’ educational records. In arguing, among other things, that states would violate the privacy law by sharing their students’ educational records with state labor agencies, as the federal economic stimulus law exhorts them to do, Gammill angered his superiors at the department to the point that they fired him despite his having only positive reviews previously, he said. Gammill seems an unlikely martyr to the cause of the fealty of federal student privacy laws. He was appointed to head the Family Policy Compliance Office in the waning days of the Bush administration — those who chose him were gone by the time he took office in January 2009, he notes — and some college officials viewed him suspiciously because of that pedigree. The Bush administration, especially under Education Secretary Margaret Spellings, was criticized in many quarters of higher education for having what they perceived as the administration’s single-minded pursuit of data for accountability purposes, and the Education Department’s holy grail was a federal “unit records” system for higher education that would provide a link to and from other databases — with the goal of tracking students from kindergarten into the work force, so that policy makers and researchers had better data with which to assess the productivity and quality of programs, institutions, states and other entities in producing graduates and furthering educational progress. Higher education critics joined with some conservatives in Congress to beat back an Education Department proposal to create such a system, with the opposition grounded in privacy concerns (though many college officials disliked it because they opposed the additional government oversight and scrutiny, too). But formally bottled up on that front, the administration pushed the same broad goals by encouraging states to create (or in some cases enhance) their own student data systems. Numerous advocacy groups, like the National Center for Higher Education Management Systems and the Data Quality Campaign, have envisioned the state data systems as the foundation for a network in which the state databases are stitched together to create a de facto national records system. As a researcher who worked for public school systems and other organizations on data warehousing and quality assurance, Gammill came into his job at the Education Department, he says, sympathetic to the idea that policy makers and researchers alike need better data than they have now to improve educational outcomes. Gammill’s background as a accountability-focused researcher made privacy advocates who opposed the Bush administration’s student records system suspicious, says Barmak Nassirian, associate executive director of the American Association of Collegiate Registrars and Admission Officers. His original perception of Gammill’s appointment, Nassirian says, was as a “going-away present from the Bush administration” who would be no friend of student privacy. Despite his belief in the limitations of FERPA, Gammill asserts, his job at the Family Policy Compliance Office required him to defend the federal privacy law. And just two weeks into his time at the department, he began having to defend the law, he says — against attacks by his own colleagues in the department. A draft that Gammill says he reviewed in mid-February 2009 of legislation that would become the American Recovery and Reinvestment Act, the federal stimulus law, contained provisions that would allow states to use hundreds of millions of dollars to build or expand student data systems. The problem in his eyes, though, was that the provisions, as written, would run headlong into provisions of FERPA designed to prevent the use of individual students’ educational records in ways that would violate their privacy. Specifically, he argued, the requirement that states link their postsecondary data systems to those of state work force agencies violates the federal privacy law as it is currently written. With that and a “host of other things that are problematic,” Gammill asserts, department officials said, “Can’t we just not enforce FERPA?” His reply: “You can’t do it without announcingthat you’re going to do it” — which the administration and Congress could have found a way to do by inserting language into the stimulus legislation, he says. More philosophically, he also suggested in internal meetings that the administration be more forthright about its approach to data systems, Gammill says. Roadblocked in its attempts to create a truly federal unit records system, Gammill alleges, the administration was throwing its weight (and money) behind building statewide data systems as an end-around the Congressional ban on a federal system. “Why don’t we just be honest and tell people what we’re doing?” he says he asked his colleagues in departmental meetings. His analysis of the illegality of the recovery law provisions and his arguments for a more forthright approach to the data systems did not go over well, Gammill alleges, especially with his boss, Carmel Martin, who was a senior education aide to Sen. Edward M. Kennedy before joining the Obama administration as assistant secretary for planning, evaluation and policy development. Gammill recalls specifically criticizing one sentence in the stimulus legislation as “silly” — and then having Martin tell him that she had written the sentence “with my own little pen on the Senate floor” while on Kennedy’s staff. “Not a good career move,” he acknowledges. Several weeks ago, Martin called Gammill into a meeting, he says, and told him that his “performance wasn’t satisfactory” and that he would be let go. Gammill says Martin gave him a memo that described his shortcomings and told him that if he signed it, he would be allowed to resign. If not, he would be fired immediately. The memo, he alleges, discussed issues that had never come up in his performance reviews — which he described as “nothing but good” — and he refused to sign it. “It said things I had done which I had not done, and would have had me agree that I had fallen short” of my job, he says. On Friday, January 15, Gammill alleges, officials escorted him out of the department’s headquarters on Maryland Avenue. Nassirian, of the registrars’ group, has never met Gammill, and says he and the former department official would probably see eye to eye on few education policy questions. Given Gammill’s research background and his predisposition to believe in the limitations of student privacy, “it is very troubling that someone who’s already as amenable to doing what the administration wants ends up being dismissed, perhaps because he insisted on following the black letter of federal law,” Nassirian says. Beyond the statement they issued about taking student privacy seriously, administration officials declined to respond to Gammill’s assertions about their actions and treatment of him. Gammill hopes to give them another chance to respond — in a legal proceeding. He says he is seeking an administrative review of his dismissal, and is looking for a lawyer to represent him. The movement to build longitudinal-data systems on student achievement has long butted heads with the Family Educational Rights and Privacy Act, better known as FERPA, a 1974 law created to protect students’ privacy. The conflicts got to be so frequent that the U.S. Department of Education, under Margaret Spellings, even updated its regulations on the law last year to make it clearer that schools may share student data with outside contractors who perform work that school employees would otherwise do, such as electronic recordkeeping and testing. This story from Inside Higher Ed suggests, however, that the conflicts haven’t gone away. In the Feb. 1 article, the Education Department’s top FERPA watchdog, Paul Gammill, contends that he was fired because he argued in internal meetings and documents that the agency’s approach to spurring states to expand their longitudinal-student-data systems was running into conflict with the privacy law. In the story, department officials made no comments on Gammill’s allegation, which they say is a personnel matter. My guess: We haven’t heard the last of this issue. Gammill appealed his termination and filed a lawsuit against the USDE stating that he was fired in violation of the Whisteblower laws. USDE filed a motion to dismiss Gammill’s complaint which the Judge granted, meaning the case will not move to trial. The take away? 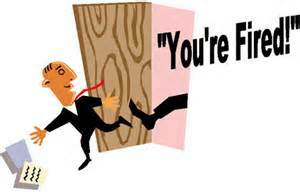 The departments plan to implement a P-20 cradle to career LDS violates FERPA. Instead of honoring FERPA in accordance with the measures legislative intent and holding privacy sacrosanct, USDE officials spearheaded an effort to decieve, manipulate and change the law thereby putting student privacy and our children at risk. Congressional hearings should be held to investigate this matter ASAP.